There is no secret that the Chinese market is a dream for any game developer. Taking into account passion of the Chinese people, their suggestibility and prevalence of mobile phones among the population (as well as the number of subscribers), a successful entry into the Chinese market can bring huge profits. In this article we will try to describe all the main pitfalls that you may meet along the way of localization for the Chinese market. So, let’s start. You have an application that you would like to release in the Chinese market. First of all, make sure that there is a demand for it, because some of the services which can be linked to your application are simply not available in China (Facebook, Twitter, Youtube, Foursquare, etc. ), some other services operate with restrictions (Google). And besides, the target audience may significantly differ from the one of your app. In this respect China strongly resembles the United States, and all that is happening outside the country for the Chinese is a nonsense, unworthy of the attention of the true 华人. But let’s suppose that your app is not tied to a specific area and you are sure that the people of China will be interested in it. Then we start the process. c) Check how the numbers are displayed in the game. The fact is that the usual numerical gradation (10, 100, 1000, 1,000,000) does not exist in China. Chinese series of numbers looks as follows: 10, 100, 1000, 10,000, 100,000,000. It means that “a million” is equal to “a hundred of ten thousands”. So when the Chinese say “50,250,100”, they mean “five thousands, twenty-five ten thousands and hundred). Accordingly, if you force the user to waste time thinking about how much goods he will receive, he won’t pay until you translate all the numbers on the Chinese model of display. d) Entrust translation of the name of the game, and all the other names in the game to a native speaker, because literal translation can turn out a nonsense. The most famous fail occured when the first Jesuit missionaries transcribed the name of Jesus in Chinese using consonant characters. The result was 亿 鼠 ( Ie Shu – a hundred million mice). So, it is better to translate correctly, but adequate for the average resident of China. e) In the end of the work you should give the app to the inhabitants of different locations in China (North, Central, West, South-East, South) for proofreading. Because a northerner won’t probably understand the word “哈 喽” and a southerner can find the pun about 金正日 是 金日成 的 儿子 a simple phrase from the encyclopedia. a) Remove all the resources that link the app to the third-party services, because most of them work very bad in China, so the webpage weighing 50 KB can be loading for a few minutes. b) It is better to integrate local services instead: the ability to login via QQ, post results in Sina Weibo, invite friends from Renren, etc. It takes very little time, but the result is gorgeous. c) Pay attention to the fonts, because there is no other country in the world where people pay so much attention to the calligraphy. Ask local calligraphers to draw some texts, pictures using different writing styles, etc. 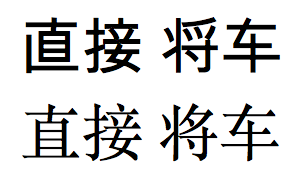 Do not forget that standards of writing fonts in China, Taiwan and Japan are different. The first one – Japanese, the second one – Chinese. d) Provide the user with a convenient way of paying. There are a lot of payment systems in China and almost all of them are easy to use: Alipay, Tenpay, PayEase and dozens of others. Do not use the services of international payment aggregators. e) If your app requires access to the Internet, place the server in the place where Chinese users will be able to quickly reach it – Hong Kong, Macau, Singapore, South Korea. Never place it in Europe, USA or Russia. Certainly, it’s impossible to remember everything, but at least you’ll be aware of this most significant issues. So, the game is localized, all the technical issues have been resolved, but do not rush, the mission is not complete yet. a) Games, wich allow the withdrawal of money are strictly forbidden in China. b) If the application allows user to create the content, take care of censoring it. If your application violates this requirement, you can even go to jail. c) Study the relevant legislation. The main documents are 软件 产品 管理 办法 (Methods of administration and management of software products) and 网络 游戏 中 修改 了 部分 (Methods of administration and management of online games). But there are a lot of other documents. d) China pays much attention to the protection of copyright. You can easily get a large fine for usage of unlicensed content or pictures without the permission of the model. All the documents should be translated, notarized and approved by the Bureau of copyright protection. So, everything is done, it is high time for release. But first we need to select a suitable site for distribution. There are only a few shops for iOS in China and hundreds for Android, and you should add their SDK, banners, splash screens with advertising to the application. Reviews of these stores can be easily fond on the Internet and the choice is not particularly difficult. After this, you will have to survive fierce competition from other similar products, untwist your application in the Chinese advertising network, promote the site in the Chinese search engines, create corporate accounts in the Chinese social networks, obtain additional licenses, etc. And, of course, take profits, which with the right approach are gorgeous. We hope that the article was interesting and useful for you.